When a hole opened up in the median of U.S. 169 near the Ironworld Discovery Center in Chisholm, the Minnesota Department of Transportation had to study exactly what was underneath the roadway to determine the risk of failure and how to prevent it. During the late 19th and early 20th centuries, a network of mining tunnels was constructed in northern Minnesota where U.S. 169 is now located. Soil sinking and/or shifting resulting from these previous underground activities had occurred in area over the years. Though the subsidence caused problems for years, a long-term solution became important when the median gave way in Spring 2007. Fearing a collapse of the 40-plus-year-old highway, MnDOT developed an innovative solution: designing a super-strong highway that could bridge a collapse underneath. It featured a doubly reinforced concrete section approximately a foot thick -- so strong the road will stay in place even if the soil below gives way. 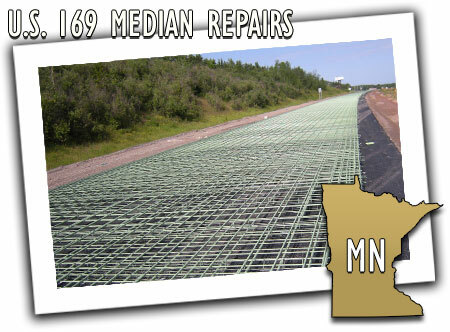 The U.S. 169 reinforcement project was completed in June 2010 using American Recovery and Reinvestment Act funding. The project cost about $7.4 million, which included 1.7 million tons of reinforcement steel and 10,000 cubic yards of structural concrete. Improvements made by MnDOT guarantee the highway's resilience in the event of any subterranean unpredictability, which could ultimately save many lives.